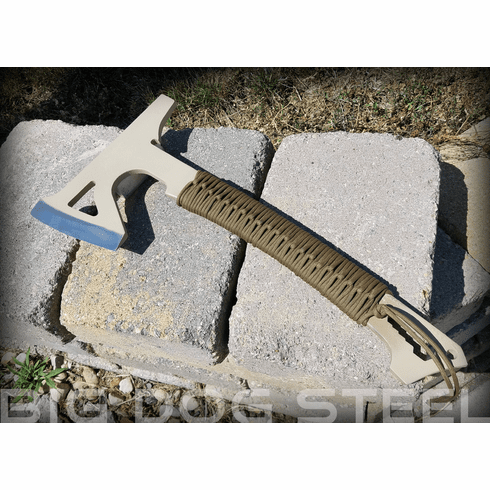 Big Dog Steel is pleased to release our Tac Axe. Constructed of incredibly durable 3/8" thick AR500. Our new Tac Axe would make a great addition to your hunting camp, backpack, truck or even for use in the field. It features wrenches for 1/2", 3/8", 5/16" & 1/4" bolts. Use it for chopping or splitting, even drive in nails. It even has a bottle opener. We hand sharpen each blade the heat treat and harden them to hold a sharp edge as long as possible. Each axe will come cerakoted FDE. This axe is literally bulletproof! Our first run of hawks should be ready to ship in approx. 2 weeks.